A totally unique concept designed to take the guesswork out of design and free you from the pain of creating and planning website content. Pre-populated with important content ready to be uniquely customised for your funeral business. We have created a ready made design gallery to help you choose. Browse our fully functioning live websites including demo text and announcements integration. Use our online content form to get up and running with a top-quality website. Fast! Click on a theme to load live website then click on the white cross (top RHS) to close demo site. Once you've browsed the designs contact us with your preferred style and any questions. information using our online form. 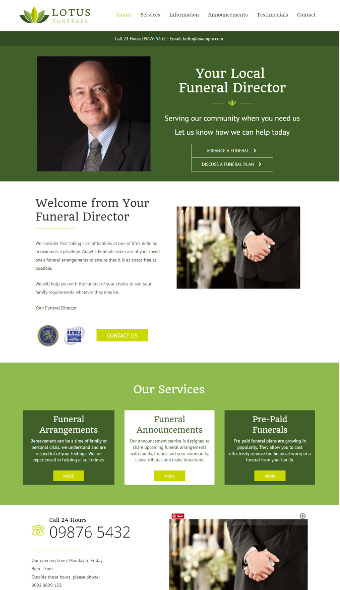 Years of experience inform us of what is needed to build a website unique and personal to your funeral business. If you have a different style or content in mind just let us know.